With a limited number of positions available in Drum Corps International units and with the incredible multitalented ambitions of today's drum corps students, it is often common to see a mellophone player switch to the trumpet section or a bass drummer take a snare drum position in subsequent years. Sometimes even rarer, though, is a color guard member who becomes drum major or a brass musician who joins the percussion section. Such is the case with Santa Clara Vanguard snare drummer Mike Girard. After trying out unsuccessfully for the Seattle Cascades' snare line with only a few months of percussion experience in 2003, Girard turned to that corps' brass section to get his start in a drum corps. He eventually worked his way up to playing snare drum, this season "aging-out" with Santa Clara Vanguard after five years of drum corps experience. DCI.org's Christina Mavroudis interviews Girard about his experiences. Christina Mavroudis: How exactly did you get involved with a drum corps? Mike Girard: A friend of mine marched as the bottom base drummer with the Seattle Cascades in 2002. He told me that I should come with him to try out for the corps. I had no idea what I was getting myself into, but I hopped in the car anyway and went. So in 2003 I tried out for a snare drum position with the Seattle Cascades. I was 16 then and had only been drumming for a few months. I got cut from the auditions immediately. I had played horn all through high school, and I knew that I wanted to be in a drum corps, so they gave me a contra to play instead. CM: It's quite an accomplishment to have had almost no experience with percussion and now be in your second year with the Santa Clara Vanguard. How difficult was the transition? MG: I knew right off the bat that I didn't have a lot of natural talent, but I was so hyped on the drum corps activity. 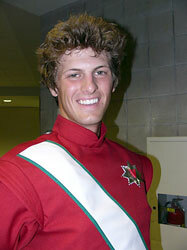 Up until then I had only seen a video of the 2003 Santa Clara Vanguard drum line. One of our snare staff members this year, Micah Hardwick, was a part of that drum line. I knew I wanted to be like that guy. I would be up late at night watching videos and trying to transcribe the parts on notebook paper to try to learn them. CM: With as many years as you have spent in a drum corps, do you dream about your experiences? MG: Absolutely. I remember on several occasions I'll be in that half awake/half asleep state and I'll be dreaming that we're rehearsing a chunk of the show. I hear eight clicks of the metronome and go to step off with my left foot and actually wake myself up when my leg jumps. CM: How long does it take after you leave the corps after a summer touring to get the music out of your head? MG: I'm still whistling our ballad from 2003! You'll get in moods where the music just pops in your head. You might be drumming on a drum teaching your high school when all of a sudden music from 2004 that you learned comes back. CM: Finally, what part of Vanguard's 2007 program is your favorite? MG: The obvious answer would be the snare solo since I'm a snare drummer, however, my favorite part of the show is in the ballad. The drum line is playing, the horns are blasting, there are full on percussive chimes, and then the horn line goes down on their knees doing Vanguard's classic bottle dance.